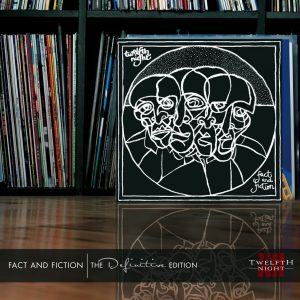 Fact and Fiction is the latest of our original albums to be given the Definitive Edition treatment. However, in a change to the previous releases we felt that, rather than augment the original LP with other tracks that featured in the band’s live set at the time, this time we should just focus on the original tracks and give a glimpse of how they had developed through the various processes of writing, rehearsing, demoing, recording, and finally being played live. I’m delighted to say that we have been able to represent all of these in this release. In addition as a number of cover versions and reworkings already existed, we commissioned new recordings from band members, contemporaries and current artists to show how other artists interpreted the tracks. We think these complement our own versions, and bring out the true strength of the original songs. To accompany the CDs there are some extensive, sleevenotes written specially, including an extract from Michael Anthony’s ‘Words & Music’ book that reviews Geoff’s lyric writing in incisive detail. In addition we have never-before seen scans of some of Geoff’s original handwritten lyrics and sketches, as well as new photos, etc. Disc One includes all the recordings done at Revolution studios: the album, the single, and the original version of Human Being. For the first time we have included the sound of the ‘locked doors of paradise’ showing how Human Being was originally linked to East of Eden. Disc Two includes a live version of each album track compiled from a number of different sources enabling us to show how Geoff, Andy and Mark (and the rest of us) interpreted the songs on stage. Several of these recordings are previously unreleased, most notably the three tracks recorded at Geoff’s farewell shows in 1983. Although these songs were released on LALL, two of these versions are from the night not featured on that album, specially remixed for us by Karl Groom. There are also as-they-were-played renditions of World Without End and Creepshow, the latter from 2012’s Summers End show, described by Prog magazine’s Jerry Ewing as “simply amazing!” And, as an encore, the guitar-based version of Fact and Fiction from A Night To Remember, recorded at the Barbican in December 2012. The live tracks are followed by the demos, recorded in our favourite local studio (where we recorded Blondon Fair for Virgin several years later). It was the time of the first affordable drum machines so to save time we often used them when recording demos as was the case for three of the demos here, while Fistful of Bubbles and Creepshow features us playing live in the studio. Confusingly, the track called Leader (aka Utopia aka Live and Let Live) later became Fact & Fiction, while the song (Constant) Fact & Fiction was never developed further. And although Geoff is renowned for his intelligent, passionate lyrics, his great sense of humour was a most welcome element in those intensive days of writing, rehearsing and recording. This is nowhere more aptly portrayed than in the ‘nonsense/stream of consciousness’ lyrics’ of Dancing in the Dream. For the first time we have added the demo of Creepshow (closing section) which starts with a completely different speech. Originally titled ‘After The Bomb Drops’, this was later replaced by the ‘Nerve Centre, Mirror one’. As you will hear this early version references the ‘haphazard planning for nuclear war’, the theme that underpins the lyrics of Fact and Fiction.